NOTE: This is a post I wrote back in 2011, but one I hadn’t published until now. Many ad features have changed on Facebook since I first wrote this, so it’s a lot better now. Because of the popularity of the Veratasium video “outing” Facebook, I felt like sharing this now wouldn’t be so damning. 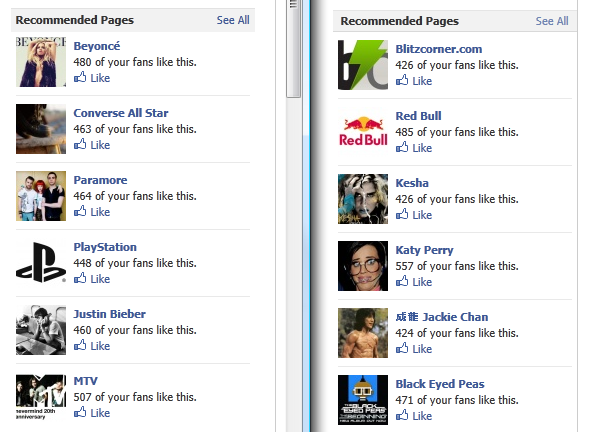 Who are those fans who’ve “Liked” your Facebook page? Are they real people or is something fishy afoot? Could there be a massive deception taking place, evident as a result of a feature in Facebook that most users probably don’t know is there? Facebook releases new features often. Along with any new release, there’s expected to be bugs and hiccups. I noticed something strange and noteworthy after an update months ago, and since it’s persisted I can’t resist mentioning. Maybe it’s just a bug. Maybe I’m just paranoid, but I’ve had a running suspicion about something that was just heightened by some numbers I just pulled out of Facebook Insights Directly. I’ve got strong evidence that most of my Fans aren’t real. Let me give you a little background info. I experiment with new marketing technologies. I’ve got a Facebook page that’s a companion to this blog. If you look over at the right hand column (assuming you’re not reading this on a mobile phone) you’ll see the most recent posts to that Facebook page. I started this blog and the Facebook page initially as a place to test things out. One thing I wanted to test on my own dime is Facebook Ads. Most of the fans that I’ve accrued for the page, around 1360 now, have come from those ads. I invest only about $6 dollars a week on promoting it – literally because it’s as low as I could bid and still get impressions for those ads. I’ve gotten a steady trickle of fans every day from it. What I’ve noted is the strangeness of the names and the profile pics. They seem almost randomly generated – like their names follow sets of recurring patterns. Additionally, the profile pics are too often images that don’t seem like they’d be something an actual person would choose to identify themselves with. I’ve often wondered whether Facebook themselves were fluffing up ad numbers through fictitious accounts – but I’ve often chalked my entertaining that notion as being overly paranoid. I’ve done countless advertising effectiveness comparisons, and written so much code around doing those comparisons. I’ve developed an incredulous view towards publishers and their ad performance claims for their publications. A small publication bending and exaggerating their numbers to help their ad sales is par for the course, but for a big player like Facebook I don’t expect it. I logged into my Facebook fan page and clicked on “Use Facebook as The Click Whisperer”. This puts me the mode where I make comments as “The Click Whisperer” and see analytics specific to that page. That lets me see stuff about the page that only page admin can see. One thing that I take a look at, regularly, is who the page fans are. What are their names, what do they look like? I began to suspect whether these Profiles belonged to real people due to the goofiness of their names. Who are some of these “goofy” names? I’m not the only person who’s realized this. Here’s a conversation on a discussion forum that I just found. RazzaDazzla found funky names “Liking” his page through ads. Way back in 2009 Tech Crunch’s John Biggs reported advertiser ire caused by bots operating within Facebook. I understand that kids under 13 can’t use Facebook but can create e-mail addresses for themselves – so there’s probably a lot of kids with fake profiles who use goofy, fake names. Maybe these are real people, maybe there’s some “make a weird middle name for yourself” trend on Facebook I’m not hip to, but don’t they seem weird in a strikingly similar fashion? Do you see the pattern? Almost as if an algorithm generated their names…. The scope of the fake Likes is revealed. Over in the right column there’s a new feature I’ve never noticed before tonight: Recommended Pages. Here’s a screen shot of how it looked when I loaded it twice in two browser windows, side by side. Do you see what doesn’t make sense? Who the heck is Blitzcorner.com? I’ve never heard of them before, but apparently half of my page fans like that page too. Curiosity got the best of me so I clicked over to the page. Given the overlap I expected to see this amazing trending brand I hadn’t discovered before. Only 9,501 fans !?!? What’s fishy is that Blitzcorner.com has only 9,501 fans. See where I’m going? Beyonce, who is also liked by half of my fans, has a total of 28,196,276 fans. Converse, another page that is liked by a number close to half of my fans has 20,089,907 fans. 560 of my fans like Eminem, out of a total of 47,138,818 fans who like his page in total. Even Dory from Nemo who has 13,436,499 shares the same order of magnitude of fans that Blitzcorner.com does. I’m not going to get all “Mr. Spock” or “Dr. Data” on you and calculate the improbability that Blitzcorner and I have such a high percentage of overlapping fans, but its obvious that something is wrong here. Half my fans like Blitzcorner? Really? It is a glitch, right? I really hope that, for the sake of the integrity of the blooming social media industry, these numbers are being caused by a glitch in the code – a simple error. Another alternative explanation is that the operators of Blitzcorner and I are secret soulmates destined to have the same fans no matter what we do. You’ve reached other conclusions? Not buying the soulmate hypothesis? Could it be that Blitzcorner has invested in Facebook ads only to yield a similar proportion of non-engaging and suspiciously named fans? Are these real people? Who would benefit from creating massive numbers of fictitious accounts? Who has the means to accomplish it? Before all of you Facebook advertisers grab your pitchforks and torches and head out for Zuckerberg Castle, don’t be so quick to blame Facebook. Even though what I’m pointing to benefits nobody more than Facebook, I don’t think they’re the ones creating fake profiles. I’m not saying they probably don’t know about it, just that the odds that they’re the ones doing it are low. There’s a clue pointing to the culprits. It’s in my screen grab image above. I have strong reason to believe it’s the Record Labels – Music Publishers. I believe they’re the ones creating the fake profiles. Back in the nineties I was webmaster for a music video channel with a unique technology to collect metrics. THE BOX published request numbers to Billboard Magazine. That made THE BOX’s request metrics particularly valuable to Record Labels who had interest in seeing their artists rank higher than their competition. Just like in the radio industry, where label promoters where known for repeatedly pretending they’re fans requesting their own artists songs get played, our little network wasn’t immune to getting “jacked”. “Jacking” is the industry term for a record label promoting their own stuff, posing as fans. Is there “Jacking” on Facebook and what impact is that having on Facebook Ad value? Come on – you’d be a fool to think there isn’t jacking going on in Facebook. The question is: What’s the scope of the jacking and how could it impact other’s investments into Facebook presences and advertisements? Let me illustrate how bots let loose by jackers can seriously impact the Facebook econosphere. Suppose a blackhat promoter wanted to create a bunch of fake profiles and make them all “Like” his Facebook Fanpage. He’d certainly go through some trouble making them look indistinguishable as fake – but Iit would have to be done in some kind of automated fashion to achieve a scale where it would pay off. It would be necessary to make sure the fake profiles “Like” other things besides the artists being promoted. The problem the blackhat promoter’s little bots operating fake profiles is this: How would those little brained bots know what other pages to like? The simplest, lowest hanging fruit for bots, or even human “Gold Miners” in Jakarta, to find obscure pages to “Like” would be to click on the Facebook ads! You wouldn’t have to tell them anything ahead of time… no tables to load up or follow… just click on whatever ad is showing in the right hand column and “Like” that thing too. So back to my numbers about Blitzcorner. It’s probability that we’d have the same degree of overlapping people who like us, given our brand awareness and similarity of content,Â is miniscule. It’s miniscule unless a fantastically large percentage of the “Like” clicks taking place on Facebook ads are being performed by indiscriminate bots, or even just people indiscriminately clicking. Bots would probably be more slick. As an advertiser on Facebook I’d like to think that my paranoia is misplaced and that the majority of my fans are actual flesh and blood people – but I’ve always been the type to question. So… here we are in 2014. I’ve embedded the Veratasium video that made me finally publish this below. 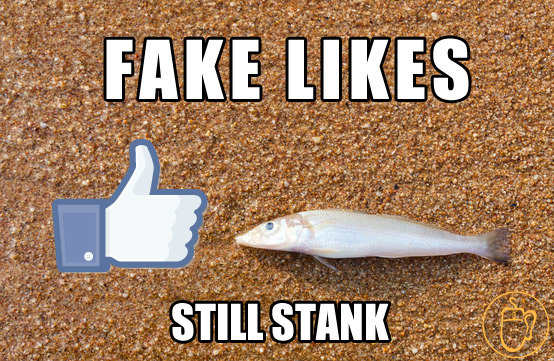 Facebook is a lot better, but the fake likes are still around. I think that as long as there’s an audience on Facebook, there will be marketers who can leverage its advertising for results. It’s just a matter of knowing what you’re doing and being realistic about expectations.